AccuraCast SearchStarz Blog: A doodle to honour labour day. 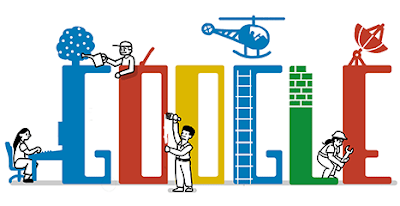 Google launches a new doodle in occasion of the International Workers' Day, celebrated on the 1st of May in many countries all around, each every year. Albania, Algeria, Argentina, Austria, Bahrain, Belarus, Bosnia and Herzegovina, Brazil, Brunei, Bulgaria, Burundi, Cambodia, China, Congo, Croatia, Czech Republic, Egypt, Ethiopia,Germany, Ghana, Hong Kong, Hungary, Iceland, India, Indonesia, Iraq, Ireland, Israel, Italy, Jordan, Kenya, Laos, Latvia, Lebanon, Lithuania, Macedonia, Malaysia, Montenegro, Morocco, Mozambique, Namibia, Nigeria, Norway, Palestinian Territories, Philippines, Portugal, Romania, Russia, Rwanda, Senegal, Serbia, Singapore, Slovakia, Slovenia, South Africa, South Korea, Spain, Sri Lanka, Taiwan, Tanzania, Thailand, Tunisia, Uganda, Ukraine, Vietnam. Enjoy this doodle! We will be waiting for the dedicated doodle of the 6th of May, May Day in the UK.